This book discusses an exciting laboratory that has been developing the practice of theatre music composition and sound design since 1961: the Royal Shakespeare Company. Musical practices have evolved as composers and musical directors inherited from the past and innovated with new technology; different interpretations of single plays in multiple iterations have provided a picture of developing styles, genres, working practices, technologies and contexts; actor musicianship has been practiced quietly and without fuss; and the role of the sound designer has appeared and transformed the theatrical soundscape. 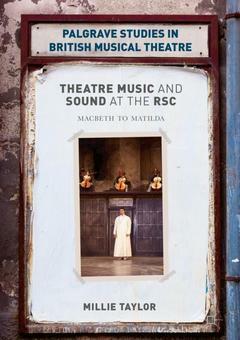 This book moves to musical theatre to evidence a continuum between its rich interdisciplinary textures and the musicodramatic world of Shakespeare?s plays, positioning the RSC as an innovative company that continually expands the creative and collaborative possibilities of the theatre. 1. Musical Collaborations at the RSC.- 2. Collaborative Composition at the RSC.- 3. Electronics, Sound and Fury at the RSC.- 4. Theatre Music at the RSC.- 5. From Macbeth to Matilda at the RSC. Millie Taylor is Professor of Musical Theatre at the University of Winchester, UK. She began her career as a freelance musical director. Her publications include British Pantomime Performance (2007), Singing for Musicals: A Practical Guide (2008), Musical Theatre, Realism and Entertainment (2012/2016). She is co-author of Studying Musical Theatre (Palgrave, 2014), and British Musical Theatre Since 1950 (2016) and co-editor of Gestures of Music Theater: The Performativity of Song and Dance (2014).